The Rolls-Royce Silver Ghost was a car model originally known as the Rolls-Royce 40/50 h.p. It was after getting to know the Silver Ghost that the prestigious British automobile magazine Autocar hailed Rolls-Royce as the makers of “the best car in the world”, a phrase that Rolls-Royce would later come to use in their marketing. Quite a few Silver Ghosts have survived into our time and many of them are still running. One well-preserved example is the Silver Ghost exhibited by the National Motor Museum in Beaulieu, England. The name Silver Ghost was not officially recognized by Rolls-Royce until 1925; until then they stuck with the 40/50 h.p. designation. The name Silver Ghost came from one specific silvery 40/50 h.p. with chassis no. 60551. You can read more about that car further down on this page. The chassis and engine of the 40/50 h.p. were used as the basis for a range of Rolls-Royce Armoured Cars. The first 40/50 h.p. cars had chassis from Royce’s factory in Manchester. In July 1908, production moved to Derby. Between 1921 and 1926, 40/50 h.p. cars were also made in the United States; at the Springfield factory in Massachusetts. From 1907 to 1926, a total of 7,874 40/50 h.p. cars were produced, of which 1701 were made in the United States and the rest in the United Kingdom. At the 1906 Olympia car show, Rolls-Royce premieered two chassis for a new automobile designated the 40/50 hp. The 40/50 hp was actually so new that the two cars weren’t even really finnished completely in time for the show, and they wouldn’t be ready for press testing until March the following year. Chassis and suspension: Ridig front and rear axles. Leaf springs all round. Engine: The first 40/50 hp had a side-valve, six-cylinder, 7036 cc engine, with the cylinders cast in two units of three cylinders each. Crankshaft: Seven-bearing, with full pressure lubrication. The center main bearing was extra large, in order to decrease vibration. In essence, the engine was divided into two 3-cylinder units. Ignition: Two spark plugs for each cylinder. In the earliest cars, trembler coil was used to produce the spark in the base model, with magneto as an optional extra. If you elected magneto, the instruction was to start the engine on the trembler/battery and then switch to magnet. Brakes: The earliest 40/50 hp cars only had brakes on the rear wheels operated by a hand lever, with a pedal-operated transmission brake for the propeller shaft. From 1910, the engine was a 7428 cc instead of a 7036 cc. From 1913, the 40/50 hp cars had four-speed transmission. Also in 1913, the footbrake system moved to drums on the rear axle. Electric lighting became an option. Electric lighting became standard, replacing the old lights that used oil or acetylene. From 1921, buyers could chose magneto or coil ignition. Four-wheel servo-assisted brakes became available as an optional. Due to continous improvements, the power output of the engine eventually reached 80 bhp (60 kW) at 2,250 rpm. After the war, development resumed, but despite the continual improvements carried out in the 1910s and 1920s, the 40/50 hp car didn’t keep up with its main competors, and went from being superior to inferior. In the year 1913, just before the war, 742 units had been sold. For the year 1922, the sales number had sunk to 430, despite the economy being significantly improved after the end of the war. Rolls-Royce realized that it was time to launch a replacement, and in 1925 they introduced the New Phantom, also called the 40/50 Phantom. After this, the older 40/50 cars were commonly referred to as Silver Ghosts by Rolls-Royce to avoid confusion. In 1912, the English aviator and racing driver James Radley competed in the Austrian Alpine Trial with a Rolls-Royace 40/50 hp, but the 3-speed gearbox proved unsuitable for ascending the difficult Katschberg Pass. For the 1913 Austrian Alpine Trial, a factory team of four 40/50 hp cars were created. These cars were fitted with four-speed gearboxes, and their engines were 75 bhp (56 kW) instead of 60 bhp, something achieved through increased compression ratio and larger carburettor. In 1907, Rolls-Royce’s Commercial and Managing Director Claude Johnson made a special order for a 40/50 hp that would be used as a demonstrator car, e.g. by participating in trial drives and test runs. The twelfth 40/50 hp to be made, with chassis no. 60551, became this car, and coachbuilder Barker built an open-top Roi-des-Belges body for it. The car was painted with aluminum paint and given silver-plated fittings. Due to its look and for being so silent, it was called the Silver Ghost, and a plaque with this name was placed at the bulkhead. It’s registration was AX 201. The Silver Ghost participated in the Scottish reliability trials of 1907, and also did a 15,000 mile test run that included driving between London and Glasgow 27 times! Both events were heavily publicised since Rolls-Royce wanted to showcase how silent and reliable their new 40/50 hp was. In this era, automobiles were well-known for having frequent failures, and they also had to make do with road conditions that were far from suitable for high speeds. Rolls-Royce took a big risk by inviting journalists to events such as these, but it worked out well for them and the Silver Phantom successfully broke a long series of records, providing the press with exciting things to write about that also depicted Rolls-Royce in a favorable light. After having been driven for 7,000 miles, the total cost for service added up to £2 2s 7d (£2.13) – a negligible sum for Rolls-Royce’s target group. Several other 40/50 hp cars were given names, but none stuck like the Silver Ghost. Eventually, people began calling all 40/50 hp cars Silver Ghosts, not just the AX 201 unit. 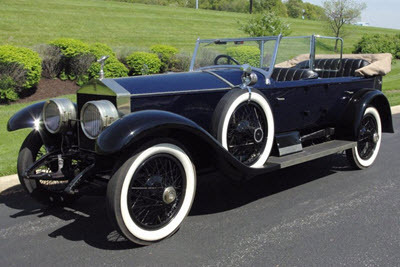 Rolls-Royce stuck with the formal name 40/50 hp only and didn’t officially regonize the name Silver Ghost for 40/50 hp cars until 1925, when they were getting ready to launch the Phantom range and wanted to avoid mix-ups. What happened to the AX 201? In 1908, the AX 201 was purchased by a private customer who wanted a car suitable for his annual vacation in Italy. Exactly 40 years later, Rolls-Royce recovered the AX 201 again. In 1984, precision model maker Franklin Mint photographed the AX 201 and used the photographes (which were very detailed) to create a die-cast model of the car. This model soon became one of their best-selling models. In 1984, the English conservative politician Lord Montagu of Beaulieu commissioned the Southampton model maker Colin Wakefield to make a brass scale model of the AX 201 for the lord’s personal collection. In 1991, it was restored by SC Gordon Coachbuilders Luton and P&A Wood, London. The car is currently owned by Bentley Motors. Since it came back to Rolls-Royce in 1948, the AX 201 has been used for publicity purposes and travelled around the world. It is considered one of the most valuable cars in the world. In 2005, it was insured for the equivalent of 35 million USD.